At MCDS, our strength comes from people, program and place. We nurture a dynamic community of hearts and minds and bring people together in a place full of possibilities: our natural Corte Madera campus. That’s why our Strategic Plan and Master Plan call for us to not only invest in our people, develop our programs and build our long-term institutional strength—but also to pursue campus projects that open up new possibilities for our students and faculty. Our new Creekside Building bring together everything that makes MCDS unique: an immersion in nature, a spirit of openness and community, and a commitment to building connections across grade levels and disciplines. Our vision began with a few simple needs: Our 1970s science classrooms are no longer adequate for the work our teachers and students are doing today, and we need more classrooms to support our Upper School classes while keeping class sizes small. These challenges are urgent, and the new Creekside Building will address them—but they’re also just the beginning of all that this project will do for our students, teachers and programs. The project includes a complete ecological restoration of our creek, as well as strategic landscaping and field drainage to improve the flow of water through our campus, prevent our Upper Field from flooding, and ensure that we can use it year-round with fewer rainouts. Each classroom will feature labs with new equipment and technologies, plus a flexible design that allows students to collaborate, research and explore. Science classrooms will be designed to allow greater access to outdoor learning spaces along the creek and in the garden. Our new Upper Field will feature a practice field and jogging path. We will also regrade the Upper School black top and add new basketball and four square courts to support our physical education and recreation programs. The Upper School garden and greenhouse will be moved from their current location to an expanded space next to the music room. This will allow us to enhance our garden curriculum and program. The redesign of the lower parking lot to increase the number of parking spaces. How many more classrooms will the Creekside Building provide? Why do we need these new spaces? Does this project incorporate green design and other sustainable features? How much will the campus improvements cost? Is strengthening our endowment part of the vision for people, program and place? How does the school intend to pay for this? Our goal is to break ground in June 2018. Construction will last 15 months. The Creekside building includes eight new flexible teaching spaces, (six science classrooms and two general classrooms), three offices and science prep spaces. Science teaching has come a long way since our current science classrooms were built in the 1970s. To prepare students for today’s world, we need flexible spaces, technologies and materials that support collaboration, creativity, inquiry and tinkering. The current project will incorporate green design and continue the extensive progress in sustainable practices that began with our 2006 strategic plan. Our goal is for the Creekside Building to qualify as a net zero energy building. We will be applying for LEED certification. 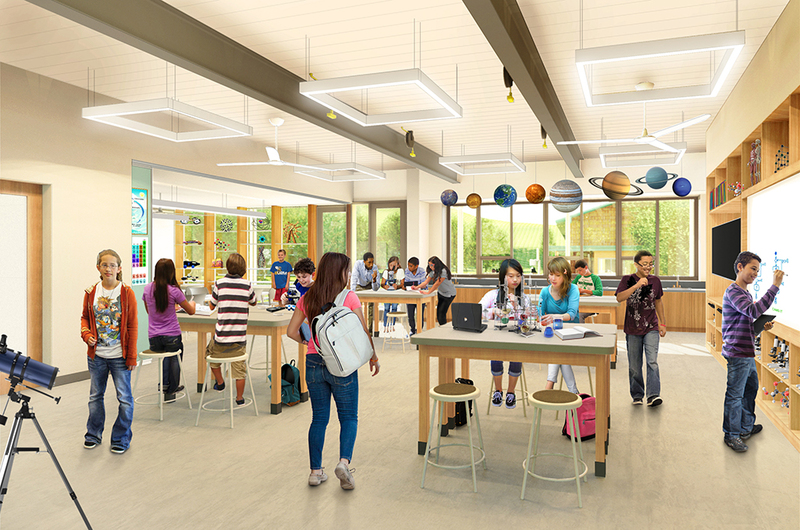 Many of the green design features that define our Learning Resource Center (the nation’s first net zero energy school building) and Administration Building will be incorporated. These include solar panels, utilizing natural light, reclaimed materials and radiant heating and cooling. The Creekside Buildings will also create new opportunities to bring sustainability into our curriculum, as we have done since 2006. The new Creekside Building, science labs and classrooms, along with corresponding Upper Campus enhancements (creating a heart of the upper campus, site preparations, field drainage, restoration of the creek) and the lower lot redesign, are estimated to cost $30.4 million. The building's design will be functional, simple and flexible. Yes. Alongside our campus improvements, the Board is committed to raising between $10-12 million for our endowment and reserves. Our endowment is an investment in people. Increasing the endowment increases the annual unrestricted income that helps maintain our commitments to (1) Indexed tuition and an economically diverse student body; (2) Attracting, retaining and developing outstanding faculty through flexible permanent funding; and (3) Long-term financial stability by providing a reliable funding source to supplement tuition income. This project will be funded through the Step Together Campaign, alongside other initiatives including significant endowed investments that directly support our students, families, faculty and staff. While this campaign is still in its early stages, all members of our community will be invited to participate in time. With over 60 years of educating children, MCDS continues to serve children and families who believe learning is a joyous, lifelong journey. We are committed to growing our financial reserves and endowment to support a creative, diverse, and thoughtful community of students and teachers. Our endowment is an investment in people. It increases the annual unrestricted income that helps maintain our commitments to indexed tuition and an economically diverse student body. It helps attract, retain and develop outstanding faculty through flexible permanent funding. It also provides long-term financial stability by providing a reliable funding source to supplement tuition income.